He preached in his log cabin home and began organizing Methodist societies as early as 1763 or 1764. The first class met in his home and soon a second met at a nearby home. 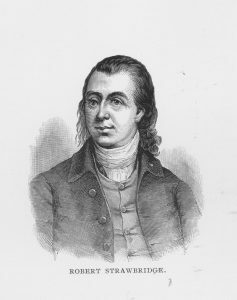 John Evans (1734-1827), one of Strawbridge’s converts, led the first class from 1768-1804. These were perhaps the earliest Methodist organizations in American history. During these early years, Strawbridge also built log meeting houses at Sam’s Creek and Bush near Aberdeen. Strawbridge, who probably was never ordained, nevertheless regularly administered the sacraments. At the first conference of Methodist preachers in America (1773), this practice was condemned, although an exception was made for Strawbridge, who was allowed to continue it under Asbury’s direction. Francis Asbury in particular was unhappy about the matter, especially when Strawbridge ignored the conference’s action and continued to administer the Lord’s Supper as before!